Reversible goggles have been attached to the existing metal frame to enhance peripheral visual restriction. Pick's Reversible Frame Hemifield Stimulator Glasses are secured within a reversible frame for easy alternation between right and left hemisphere stimulation and are made of the highest quality non-prescription lenses. 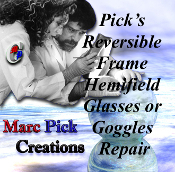 Repair for Pick's Reversible Frame Hemifield Glasses or Goggles. Pick's Reversible Frame Mesencephalic Hemifield Sedator Glasses are secured within a reversible frame for easy alternation between right and left hemisphere sedation and are made of the highest quality non-prescription lenses. Pick's Reversible Frame Hemifield Sedator Glasses-Low Frequency are secured within a reversible frame for easy alternation between right and left hemisphere sedation and are made of the highest quality non-prescription lenses. Replacement frame for Dr Pick's Reversible Frame Hemifield Stimulator Glasses (works for all of our glasses: red/blue, red/clear, red/black, etc.). Includes the entire metal frame and applicable screws. A pair of replacement stems and screws for for Dr Pick's Reversible Frame Hemifield Stimulator Glasses (works for all of our glasses: red/blue, red/clear, red/black, etc.). Full color photo glossy finish wall chart displaying the complete classification of axons. Full color glossy photo finish wall chart depicting Cerebellar vestibulo-ocular motor reflexes. Full color glossy photo finish wall chart displaying an actual axial cross-sectional dissection of the spinal cord. Full color glossy photo finish wall chart displaying the Neurology of the Optokinetic reflex. Full color glossy photo finish wall chart displaying the entire spinocerebellar system. Full color Cervical Sclerotomes chart. Full color Lumbosacral Sclerotomes chart. The Optokinetic Tape is made from quality, durable fabrics. Three interchangeable color filters for your disposable penlight. Brought back by popular demand the ophthalmic glove offers the practitioner the same three light filters (red, blue and yellow) as found in our penlight filters but has the added advantage of light intensity modification which is absent in the penlight filters.